The full market is open three days a week, Thursday – Saturday. The market has an extensive array of offerings from meat, cheese, baked goods, ready to eat food, food to take home, spirits, produce, the market goes on and on. Coming from Edmonton where we have a handful of markets that easily fit under the roof of a building less than a quarter of a city block, it was dizzying to see all the vendors and we had no idea where to begin! I felt envious that we didn’t have multiday markets so busy, diverse and large, but knew that London actually has the population to support a market of this breadth and caliber. 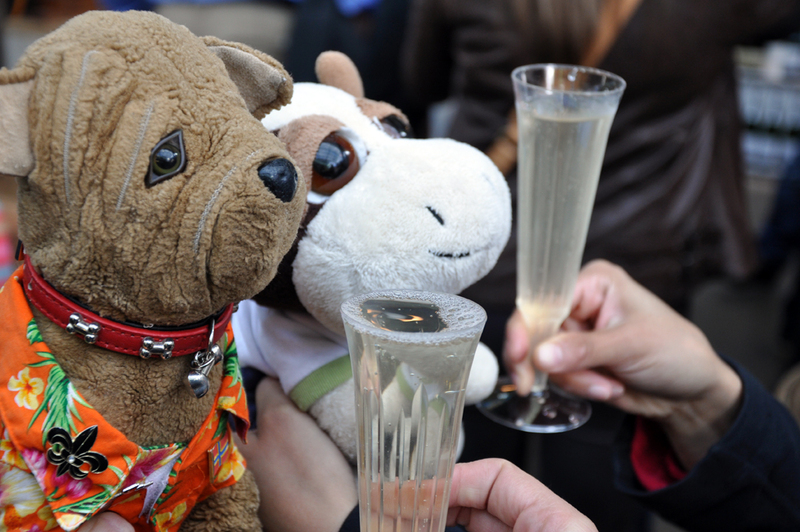 We started the visit with a glass of prosecco, served in plastic champagne flutes so you can wander about the market with them. Least to say, wandering the streets with alcohol in hoof was a very different experience for Moo, since that doesn’t happen back in Edmonton, but it was a nice way to begin our visit, to a very busy and lively market! What struck me the most about the market was the array of food vendors, selling food for people to eat while they did their shopping. 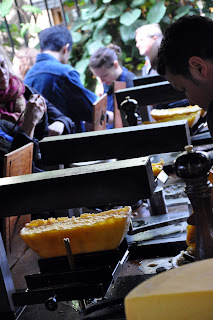 Everything from Indian food to raclette, which if you don’t know what raclette is, it is cheese that is heated up until it begins to melt. They then scrape off the parts that are melting onto your plate and it is eaten commonly with cured meats. We wandered the market, marveling at meringues the size of Moo! Truffles sold individually, as pates, or in butters, at prices much more reasonable than I’d ever seen in Canada – least to say I wound up buying some truffle butter to take home with me. We also got to sample a large array of artisan cheeses, cured meats, and even a delectably thick and creamy mushroom pate! No visit would be complete without going to visit the famous Neal’s Dairy Yard! 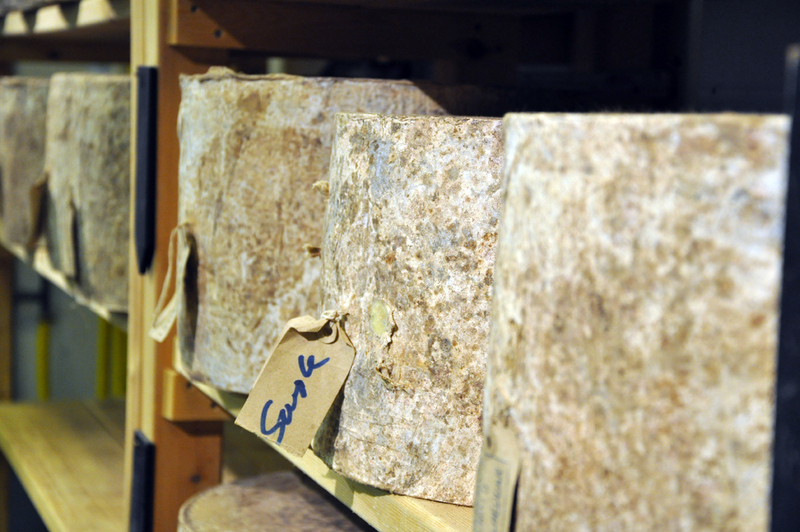 Where cheese is stacked to the rafters with wheels of cheese larger they’d probably flatten me if one fell on Moo! 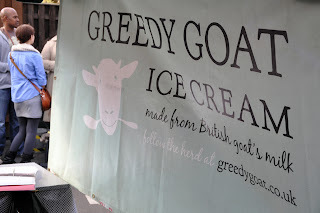 However, our favorite find of the day was The Greedy Goat, an ice cream vendor that makes all of their ice cream from goats milk, definitely not something we’d find at a local ice cream parlor back home in Edmonton. With a variety of flavors to choose from, it was hard to decide what we wanted. Luckily with four humans and two faux furs, we were able to each choose a different flavor and try a good variety. The honeycomb had a very subtle honey flavor but had nice large chunks of honeycomb within the ice cream, while the chocolate ice cream was a nice dark chocolate, perfectly rich without being overly sweet. The lemon, lime and basil ice cream was incredibly refreshing with the lemon and lime flavors shining through and the cheesecake and raspberry ripple had a deep and decadent cheesecake flavor to it with a refreshing hint of raspberry popping through each bite. Although I had initially been worried that there would be too prominent of a goat’s milk flavor, it turned out that wasn’t the case and the ice cream really hit the spot during our full morning wandering through the market. So if you are ever in London, make sure to set time aside to wander through Borough Market, and make sure to go when you’re hungry! There are plenty of incredible things to see and sample! And don’t forget to grab yourself some goats milk ice cream from The Greedy Goat while you’re wandering about, you won’t regret it!